Terrorism is a psychological war, terrorists depend on terrorizing people, so fear and cowardliness will control and change people’s behavior and divide their society. We decided not to let fear control our life or to get into our hearts. We decided that nothing will break our unity, nothing will destroy our country. The only way terrorism can win this battle, if we get divided or if we lose faith in our principles and strength. On the 24th and the 25th of January 2014, Muslim Brotherhood terrorist organization launched many terror attacks against Egyptians, security forces, private and public properties. Doctor Ahmed Kamel the health ministry media counselor declared the outcome clashes and violence on the 25th of Jan 2014 are 49 death in 4 cities (Cairo, Alexandria, Menia, Giza). Injuries 247 in 8 cities( Giza, Alexandria, Fayoum, Ismailia, Menia, Cairo, Assiut, Beni Suef). On 24/1/2014, 87 injuries in 11 cities ( Damietta, Alexandria, Giza Beni Suef, Sharqia, Cairo, Fayoum, Behera, Minia, Ismailia, Qena). 15 death in 8 cities (Damietta – Beni Suef – Fayoum – Menia – Giza – Behera – Qena – Cairo). In all Places that eye-witnessed bombings and bombs planted in different streets and cities in Egypt, the Muslim Brotherhood demonstrators were not seen in any of these targeted areas! For instance, Every Friday, the Brotherhood supporters gather in specific areas in Cairo, except this time on the 24th of Jan, Cairo was exposed to 4 bombings in different areas, the Muslim Brothers stayed totally away from these areas, Is this a coincidence, or they had a prior notice not to go near these areas?! On the 24th of Jan 2014, Muslim Brotherhood terrorist Organization warned Egyptians to stay home on 25/1/2014 for their own safety. The 24th of Jan bombings was a direct threat message to Egyptians, Muslim Brothers thought with their usual stupidity that Egyptians are going to be terrorized and they will act like chickens and stay at home. Egyptians went on 25/1 to all squares in Egypt just to give one message, that they are not scared of Terrorism and they will never give up their freedom and they are determined to release the country from terrorists. In order to continue our fight against this black pure evil terrorism, we were in need to smile and to sing, to feel happy despite our pain and suffer. It doesn’t help to allow this feeling of bitterness and sadness, or feeling sorry for ourselves. We are warriors, we are in a war against terrorism and to win this war we need all our strengths in fighting terrorism. Tears have no place in our eyes now, we will cry and accept condolences for our martyrs, the day we will defeat terrorism and cut their roots from our territory. We are not armed, and we are not fighting terrorism with weapons or bombs, but we are fighting with our unity and we are confronting all challenges to move forward and not to allow anything to stop us from continuing the path we have chosen with our own free will. 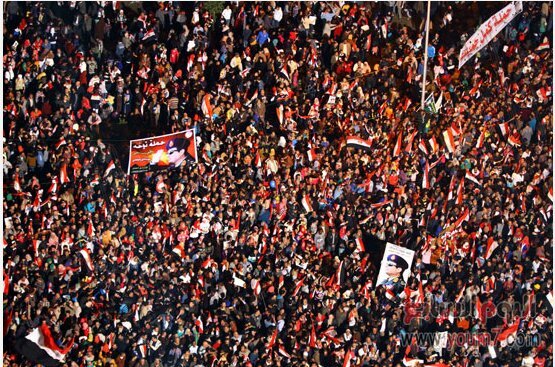 Egyptians who went in all squares all over the country on 25/1/2014, were not forced to go, they went voluntarily simply because they knew that their country needed their support. This is the greatness of Egyptians, they laugh, live a normal life and challenge all their crisis despite this fierce unmerciful terror attacks and they never kneel except to their God. The majority of Egyptians who participated in the 25th of Jan 2014, were from middle class and under poverty class. Despite the difficult economical status and the daily struggle to survive, all the people I talked to, were searching for the light at the end of the dark tunnel. They have a strong will for patience as long as they reach the light, no matter how long it will take. They did n’t go to private schools or private universities, but they discussed politics better than any political expert. There were only two symbols on the 25th of Jan 2014, The Egyptian flag and the Supreme Commander in Chief of Armed Forces Abd El-Fatah El-Sisi’s images. 25/1/2014 was challenging terrorism and ordering Sisi to go for the elections. 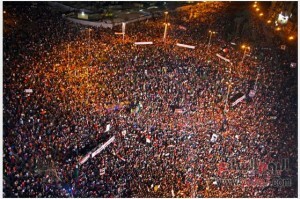 This is a very critical period in the Egyptian history, Egypt cannot handle experiments for the next stage. Egypt needs a strong leader and a great economic program to deal with all our problems. Egypt needs the good example to follow in all aspects. Reforms are not going to take place by pushing a button or by changing the whole system. We first need to change ourselves, to learn from our previous mistakes and to specify our targets and a time schedule and a plan to reach our goals. If Sisi decided to go for the presidential elections, I’m sure he is aware of the big challenges and responsibilities he will be facing. I believe that Sisi will be the first presidential elections candidate who doesn’t really need any marketing for his campaign. He already got the approval and the official popular stamp from the Majority of Egyptians. 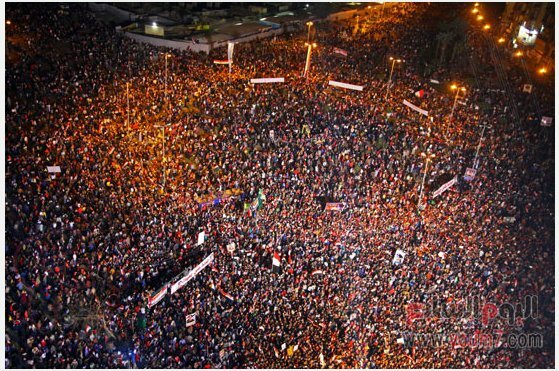 The Guardian published images from Tahrir square on 25/1/2014 and claimed that huge protests anti government in Egypt took place. On 26/1/2014, they corrected the news with just one poor line after spreading the original faked news to many of their readers. What can I say, except what I always say, The Guardian is like many foreign news agencies renting their pages for money, in order to be able to pay their lousy journalists and reporters salaries. What a disgrace! 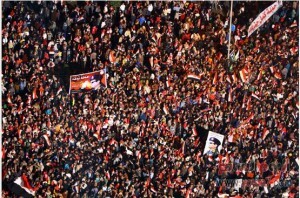 It is the street in Egypt that creates all events in relation to politics. The military is not ruling Egypt like Foreign Agencies are claiming, the military is protecting Egyptians and the country’s national security. The street is the real leader and commander. And it will always be what we want and not what the US administration or their allies want to force on us “faked Democracy by force”. Egypt is ruled by Egyptians and will never allow any one or any foreign government to lecture us on how to run our internal affairs. Videos and images from Etehadeya presidential palace. 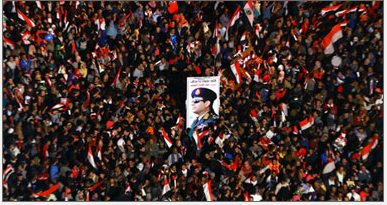 Egypt uprising against terrorism and calling Sisi the next president of the Arab Republic of Egypt.